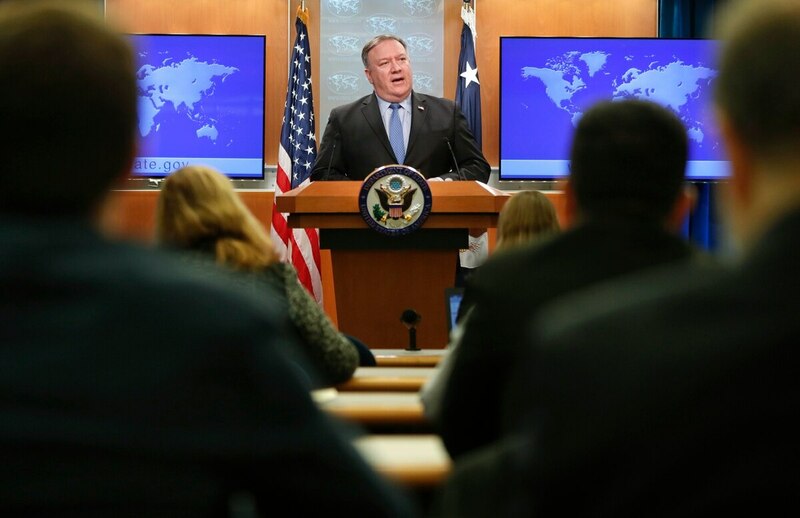 WASHINGTON — Secretary of State Mike Pompeo said Tuesday the U.S. has “made clear” to South Korea that progress on disarming North Korea should not lag behind the expansion of relations between the two Koreas. Pompeo said there's "complete agreement" between Washington and Seoul on this, but his comments to reporters underscore U.S. anxiety over a potential disconnect with its close ally. Pompeo said the U.S. and South Korea set up a working group, which is meeting in Washington on Tuesday, to ensure they don't "talk past each other" on their dealings with North Korea. U.S. Special Representative for North Korea Stephen Biegun was holding the talks with his South Korean counterpart, Lee Do-hoon. "We have made clear to the ROK that we do want to make sure that peace on the peninsula and denuclearization of North Korea aren't lagging behind the increase in the relationship between the two Koreas," Pompeo told a news conference, using the acronym for the South's official name, the Republic of Korea. "We view them as moving forward together." A report based on satellite imagery has identified 13 secret facilities used to produce missiles and related technology. So while North Korea is pressing for sanctions relief now, the U.S. is continuing to intensify economic restrictions and says it won't relent until Pyongyang denuclearizes. North Korean leader Kim Jong Un observed the successful test of “a newly developed ultramodern tactical weapon,” the nation’s state media reported Friday, though it didn’t describe what sort of weapon it was. That's not been opposed by the U.S., but last month, South Korea was forced to walk back on a proposal to lift some of its unilateral sanctions against North Korea, which was viewed as premature by Washington. At that time, Trump retorted that Seoul could "do nothing" without Washington's approval.